Ethical wills hold an enduring tradition in the Jewish faith. Typically created by families, they are intended to preserve and transmit ethical values from generation to generation. 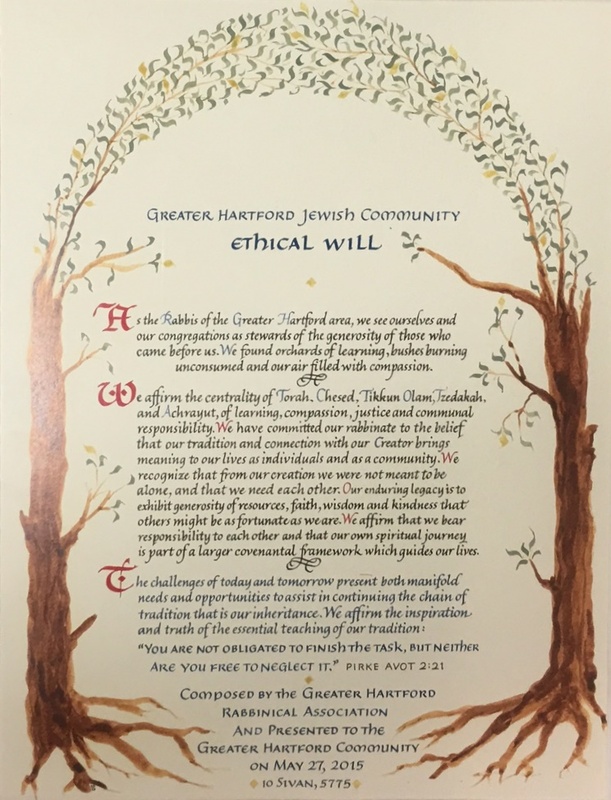 As part of the Aim Chai Endowment Campaign, the rabbis of the Greater Hartford Rabbinical Association came together to compose an ethical will intended for all the members of our Greater Hartford Jewish community. We believe this is the first community-wide ethical will in existence. Presented to the community by Rabbi Michael Pincus of Congregation Beth Israel, West Hartford, and Rabbi Gary Atkins of Beth Hillel Synagogue, Bloomfield, the Ethical Will was received with tremendous enthusiasm, positivity and appreciation. It is currently on display in the Federation offices.